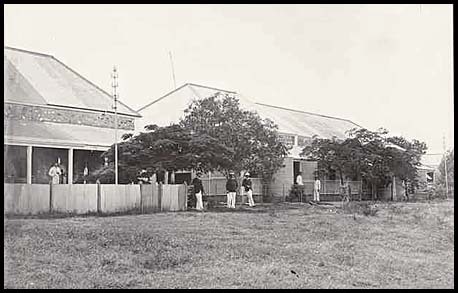 The British Australian and Government buildings at Darwin. Adelaide Observer 11 January 1873, p. 11. 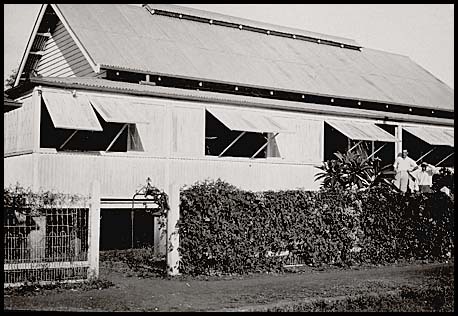 Mr Todd noted: "At Port Darwin it was necessary to provide offices and quarters for the staff of the British Australian Telegraph Company, in addition to the offices and quarters for our own staff. We had, therefore, to erect a very large building, consisting of a central building and two wings. The site chosen was the one originally recommended by Todd on the esplanade near the Government residence facing the harbour, of which a fine view is obtained. 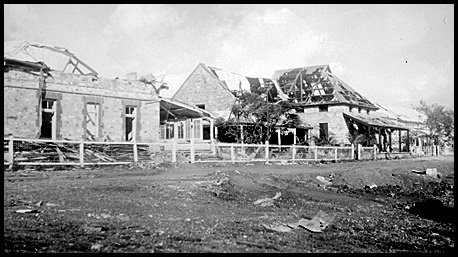 The buildings were of stone, roofed with iron and were surrounded by a broad verandah; the floors were concrete to prevent the woodwork being destroyed by white ants. There were also outbuildings for stables, stores, workshops, &c., and two large underground tanks, each capable of holding 12,000 gallons of water. The buildings stood on four acres of ground, fenced in and half of which were conveyed to the Company, who of course paid for the cost of their portion of the building. The central building comprises three offices, one of which is used by the British Australian Company. The other two are used by the Department, one for an operating-room, the other for the public on the business of the Telegraph, Post-Office and Customs. & part of BAT Quarters on right side. Port Darwin. There is also an oval stamp on the reverse for J. M. Nelison, Photographer. A scarce relic still in private hands. The joint offices in 1872. Source: NLA 1007 16395/SA State Library B8752. Postcard from Raphael Tuck's Oilette series of Australian scenes. Used 9 June 1906 Sydney to Wellington, NZ. 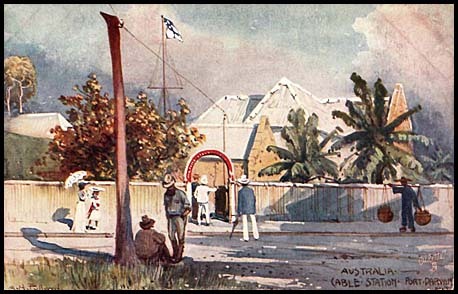 The Darwin Telegraph Office and Cable Station 1875. The Superintendent's Residence and Office in 1872. Source: Library of South Australia B10842. The South Australian quarters comprise a house of five large rooms, a detached kitchen, and bath room for the Stationmaster, and two detached rooms for one assistant operator, the men being accommodated in adjoining huts of wattle and dab. Source: State Library of SA B25067. The British-Australian quarters consisted of a long range of buildings, containing 10 rooms in all, being quarters for the Resident Superintendent and five (5) assistants. The rooms were large, one being a billiard-room and library, a handsome billiard-table and a good collection of books being provided by the Company, who also gave their officers a light rowing gig. 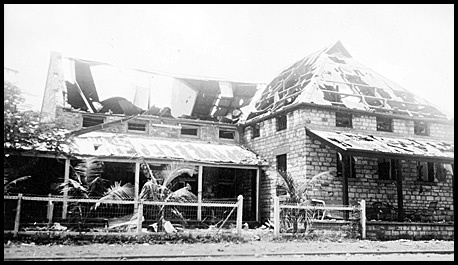 The Overland Telegraph Building and the British Australian Telegraph Company buildings were destroyed in the Japanese attacks starting on 19 February 1942. Source: National Archives D955 PC1986-848.